From the dashboard, select the publication you wish to work on. Select the issue you wish to create the article in. (If you are working in an article based publication, ignore this step). From the article manager, click the 'add article' button at the top right. Give your article a name and (optionally) a description. To create a blank article, select 'No Template'. (to create from a template see below). Select the style you wish to apply to the article. Click 'Create'. Your new article will be created and appear in the article manager list. Give your article a name and a description. From the template list, select the template you want to create the article from. When creating an article from a template, the option to choose a style is not available. The article will use the style associated with the chosen template. The style can be changed at any time from within the article manager. Click 'Create'. 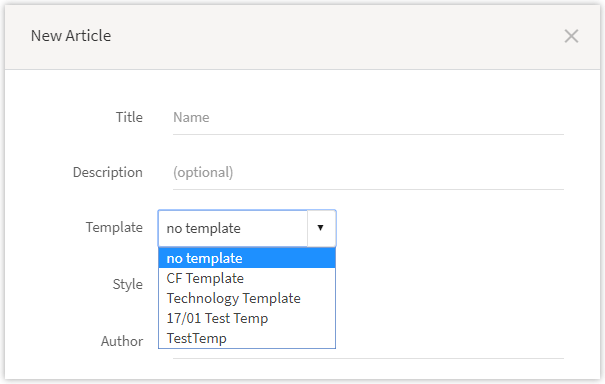 Your new article will be created from the selected template and will appear in the article manager list.